This is probably over my 50th time seeing this, and I absolutely love it every time I watch it. This film has never looked any better, this Blu-ray is spot on perfect. This is a true classic Film Noir. This black and white classic needs to be seen and thankfully now it has a proper, perfect display on a lovely high class Blu-ray, brought out by Twilight Time. This is a film that actually is a unique suspense crime drama that becomes a thought provoking, and intense reality as you watch the plot unfold. Your setting is in New York. Your main character is Detective Dixon. Dixon has a temper. He has a natural way of getting in trouble. Introduce your criminal Ken Paine. During a fight Dixon hits Paine, a little too hard and ends up killing him. Dixon goes about covering it up by putting the body in the river. When the body is found, he soon is assigned to find Paine’s killer. Dixon decides to try and frame and put the crime on a local gangster, Tommy Scalise. But a cab driver ends up becoming the prime suspect. Dixon then tries to clear the cab driver because he is innocent. So begins one obstacle after another as the plot thickens, and the cat and mouse game of secrets and lies, become a whirlwind of complex choices and realities that Dixon, and everyone around him become a part of. This stars an amazing actor, Dana Andrews as Detective Mark Dixon. Andrews is a flawless performer. He was such a gifted actor. He was able to in a sense, give a beating heart to a fictional character, and make you believe every character he displayed. His role of Dixon is amazing. His performance is dynamite. Andrews is what I consider one of those actors that few could ever compare to. He had the likes and ability as a masterpiece performer and goes up there with, James Cagney, Cary Grant, Humphrey Bogart, Gary Cooper, John Wayne, Charlton Heston, Klaus Kinski and many others. Andrews had that stardom, that classification of brilliance. He always shined in his roles. Most know him from his amazing performance as Fred Derry in the 1946 classic, The Best Years of Our Lives. Whatever he did, he mastered it with an ease and clarity that so many actors lack this day and age. That brings me to the film Laura brought out in 1944 starring Andrews and also Gene Tierney who is also in Where the Sidewalks Ends. Laura was another classic film noir directed by the director of Where the Sidewalks Ends, Otto Preminger. Preminger was and in my viewpoint a director that should be remembered, honored and spoken about when mentioning all the great directors in film. I feel Otto has been lost in time. When I mention him, most have no earthly idea who he is, and that is a true shame. Otto had away with his films that dug deep into the subject, held onto that darkened suspense, or that intense dramatic reality that was his films. He was a director that stepped over the boundaries of subject matters that was taboo for their time. From drugs to homosexuality. He pushed the boundaries, and showcased a brilliance in capturing a story that always seemed to linger in the mind of viewer long after the film was over. He mastered the reality of creating a thick book form of storytelling through his direction. He was a man that enjoyed pushing the limits of his time, by adding eye opening and taboo realities. He seemed to almost laugh in the face of censorship, but that is what makes him a shining artist of film making. 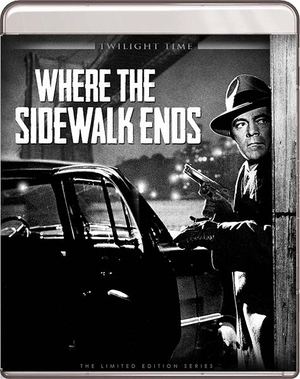 From Laura, Where the Sidewalk Ends, The Man with the Golden Arm, Anatomy of Murder, Bunny Lake is Missing, (which might I add Twilight Time released on a special edition Blu-ray which you can read my review for it HERE ) and so many others including a personal favorite of mine, 1960’s Exodus. I could go on and on about his films. He mastered so many. Where the Sidewalk Ends is a classic film that needs to be seen and thankfully through the brilliance of Twilight Time, this film has gotten a worthy treatment to display, own and speak about. This is a wonderful must own blu-ray of high quality. The movie is fantastic, brilliant acting, tight mastery in direction. The cinematography is another prime example of brilliance. This was captured in a darkened nature of suspense. The black and white bleeds on screen in a mix of emotions. Joseph LaShelle mastered the lens in capturing this film through his cinematography. The whole movie is a work of art. I feel this movie is a prime example of just how to make a lasting picture. Another prime example of how to treat cinema. I have to say I don’t want to see it any other way. This is a beautiful crisp video transfer. High Definition is spot on. Truly a crystal clear clarity of imagery. The audio is equally the same. The sound is amazing. Both audio and video is spot on perfect. Isolated Score Track by Cyril J. Mockridge. He was another composer that new his craft and gave it to the film world in many features, both big and small. He was nominated for an Oscar for 1955’s Guys and Dolls. He also worked on the small screen, doing the music for the sci-fi, cult classic Lost in Space. He had a mastery to him that transcended all styles of film. He has parts in composing, music departments, soundtracks of all styles. Sadly, a lot of his work was uncredited. But many of his films are truly memorable and are some of the greatest films ever done. He had such an ability at the music world in capturing flawless examples such as: 1947’s Miracle on 34th Street, 1962’s The Man Who Shot Liberty Valance, and many, many others. It was really great listening to this extra of an isolated score. Audio Commentary with Film Historian Eddie Muller. Really liked this commentary. A great listen, very informative. A film historian that knows his stuff. Eddie Muller is a great writer. I love reading his stuff about film. He has a total passion for cinema, especially for Film Noir and it shows in everything he does. His commentaries are really fantastic and some of the best out there. I have been a fan of Muller for many years now, always great to hear him talk about the passion of Film Noir. A fantastic Film Noir. A fantastic piece of cinema period. A flawless transfer to Blu-ray. A wonderful Twilight Time Blu-ray 3,000 Unit special edition. A fantastic product to own. Amazing audio and video presentation. A fantastic commentary. A wonderful isolated music score. Where the Sidewalks Ends is a film that needs to be seen. It’s a film that is perfectly woven in crime suspense and an intense undertaking taking of moods, emotions, and the reality of what is going to happen next. It leaves a lasting impression upon the watcher. A dynamic roller coaster of a black white mystery that stands the test of time, as being an important piece of film history. Highly Recommended.